Material: Soft, very comfortable fabric. Quality feel. Looks nice and washes well and dried quickly. Fit: (Tester - Female, 5'7", solid build.) Good fit. Plenty of length to tuck into trousers. Short sleeves. Wicking Properties: Was wearing this as a base layer with only a good quality waterproof jacket on top. Overall, wicking was very good - I did feel comfortable all day - even after two steep climbs. Other Features: T-shirt features Insect Repellency. On several trips I have noticed that insect bites were confined to my legs rather than arms so the insect repellency seems to work!! 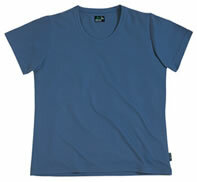 Good quality, wicking base-layer - but £20?